I’m going to celebrate Memorial Day weekend by taking a few days off from posting. I’ll be back with new material and, hopefully a mess of fish or two, on Tuesday, June 27! Can you stand it that long? Summer is here and the fish know it, too. Scattered spring patterns for catching fish have changed allowing fishermen to lock in on basic summer patterns on most area lakes. Bream are on the beds and in the shallows. Crappie are suspended 4-6 feet deep out in 10-15 feet of water. Bass are hitting shallow early and late and finding humps, ridges or grass lines to hang out in during the day. Even though it has been pleasantly cool in the mornings, I feel safe to finally say the last “cold front” has passed. Don’t bet any money on that, though. Lake D’Arbonne is just slap full of small catfish. You can catch them along the banks or shallow stumpy areas just about anywhere. They are finishing up the spawn and super aggressive. You can catch them on worms and sometimes even on crickets. And when I say small, that isn’t totally true. It isn’t unusual to hook a 2-4 pounder that will stretch a mini-cast or fiberglass fishing pole to the max. Bream are on the beds and are shallow as well. Bass fishing has been good. Last weekend’s FOM tournament revealed that they are in 5-8 feet of water hitting crank baits and plastic. They key to white perch success isn’t as much your bait these days as your patience. It takes a while to find them, but they are suspended in deeper areas. Fish slow and be patient and you’ll be rewarded. At Lake Claiborne, the story is much the same. Claiborne has more good fishing on the northern ends for crappie and bass this time of year due to more structure, but the bank areas and flats all over the lake are producing as well. The water has been up here a bit and was off color when I was there earlier in the week, but things are settling back down. One bonus fish here is Mr. Striper. Some good ones have been being caught in open water. Jigs and deep diving crank baits work best for them. Use stout tackle. A four-pounder can feel like a 20-pounder. Bream fishing at Cheniere Lake and Black Bayou is also good. Fish are in the open areas near clumps of trees or brush along the bank. No reports on the bass. 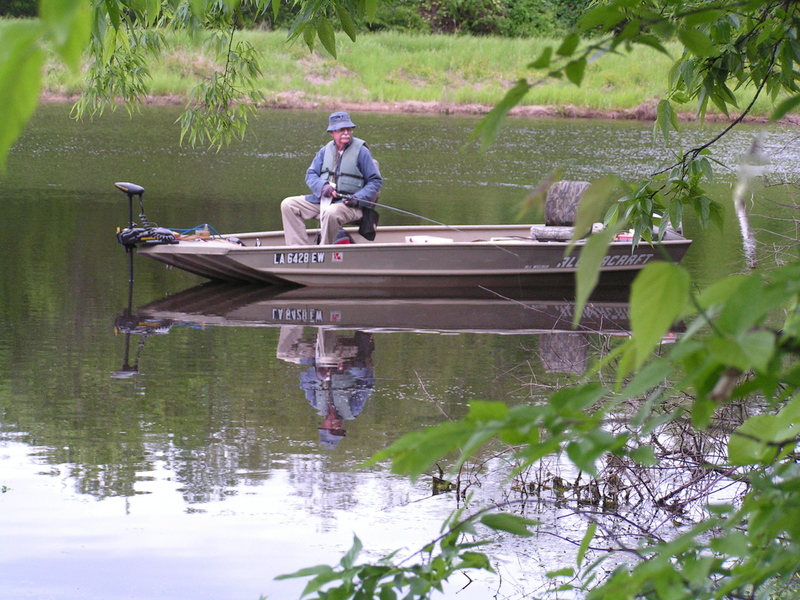 The Ouachita River is up and muddy again, but some bass and crappie catches are reported off the river in lakes and cuts. Poverty Point crappie seem to have slowed, but catfishing and bream are doing great. Big bass at Caney Lake are doing fair. No huge ones reported the past couple of weeks, but several in the 6-8 pound range. Crappie are suspended here, too and bream are on the beds. With the big holiday weekend upon us, look for the summer pattern of pontoon boats and jet skis hitting the open water as well. It’s shaping up as a great Memorial Day weekend, so expect lakes to be busy. Be careful out there. And take time to honor those that gave their lives to protect freedoms that we enjoy in this country. Memorial Day is Monday and is the day that honors men and women who died while serving in the U.S. military. Originally known as Decoration Day, it originated in the years following the Civil War and became an official federal holiday in 1971. Many Americans observe Memorial Day by visiting cemeteries or memorials, holding family gatherings and participating in parades. Unofficially, at least, it marks the beginning of summer. Make sure you kids know why we recognize this day ….and what it really means.